A complete cruciform C11 church with an apse. Many windows are later. There was much rebuilding in the C19 and, after a fire, in 1987. Worth is at once a glory and a mystery. 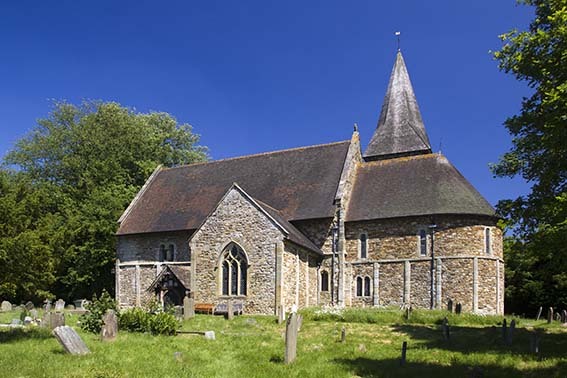 Domesday Book lists it in Surrey and the mediaeval parish consisted of over 13,000 acres, suggesting it was little developed with a small population, yet the church is large. Most early churches in Sussex are on the Downs or the coastal strip, where most people lived, but here the manor was a forest reserved for hunting and granted to William de Warrenne by William II 3 p14); in 1065 it had been held by the brother of the abbot of Chertsey (ibid p13), who may have had influence over the area. The Mole, a tributary of the Thames, rises in the parish and the first settlers may have come up the river (Barr-Hamilton p65). This hypothesis is in effect followed also by Peter Brandon (p92) but is open to the objection that Surrey was itself then a backward area. Three parishes were formed from Worth in the C19 (Crawley Down, Copthorne and Turners Hill) and much of the rest was built up after the railway came. The area round the church has in effect become part of Crawley, but its immediate surroundings have changed very little in 100 years. The church keeps its original plan of apsidal chancel and lower porticus, a form of transept that is not quite at the east end of the nave. 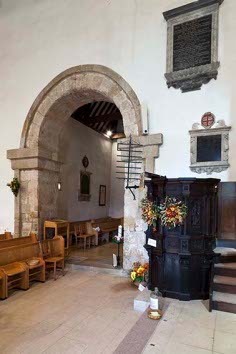 It is thus not fully cruciform and the lack of a fourth arch on the western side shows a crossing tower was never intended, making it closer to the plan of Bishopstone, East Sussex, than to a church like Stow, Lincolnshire, a C11 church which has a full crossing. The precise date of Bishopstone is controversial but Ralegh Redford believed it to be C8 or C9 and the existence there of porticus led him to suggest a similar date for Worth, at least as regards the plan (8 p137); however, the weight of the evidence points to the C11. The builders were probably not local; perhaps they were royal craftsmen. Much supporting evidence for a C11 date is provided by the fabric. Despite extensive restoration, amounting in part to rebuilding, old drawings show this was mostly done carefully. The nave has tall, relatively narrow proportions and both porticus and the lower parts of the walls of the south nave and chancel have plain pilaster-strips, rising from a plinth of two steps, whilst the Sharpe Collection drawing (1805) shows pilasters on the east wall of the south porticus only at the top. They now extend down to the plinth, but a blocked recess inside (now containing a smaller plain pointed opening) suggests the former presence of an apse which has been called C13 (3 p12). In view of the round head a rather earlier date seems preferable, if indeed it is not part of the original structure. The upper parts of nave and chancel are separated by a string-course, the top of which in the nave is chamfered. Here, it acts as sill for pairs of round-headed lights, the heads of which have through-stones, separated by a bulbous pilaster on a square base with a heavy square abacus. Such double windows are commoner in towers, though there are others in walls at Brixworth, Northamptonshire and Wing, Buckinghamshire (Baldwin Brown p364). 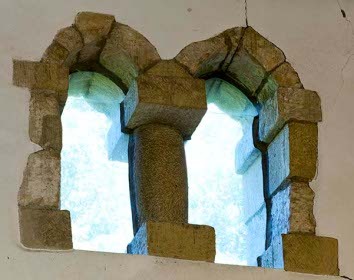 The combination of features points to the mid-C11, i e pre-Conquest, though a blocked single window in the south porticus, its head formed from a single stone, could of itself be late C11. The north side of the nave lacks pilasters and is faced in ashlar. This could have been done at a later date, though the reason is hard to guess, or alternatively, there were adjacent buildings (4 p241). 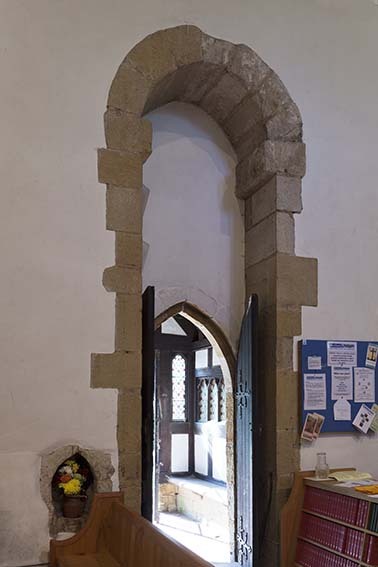 The tall (14ft) and much restored rere-arch of the south doorway remains, though its jambs were cut away and the top blocked when the present C13 doorway was inserted. The equivalent on the north side is less restored, but its lowest part has disappeared. The height of the rere-arches could suggest that only the lower part of the door was opened, beneath a fixed wooden tympanum (7 p12). The purpose of the row of corbels at the top of the nave walls is uncertain. The chancel is long for the C11 and the west parts of its walls are straight. It was apparently totally rebuilt in the C19, including the foundations, though the presence of contemporary decorative painting on the rere-arch of a C14 lowside (see below), could suggest that some walling, at least of the western part, was spared. Nevertheless, it now lacks the other later alterations seen on the Sharpe drawing. The pilasters contain old stones and the single-light windows above the string-course of the apse are plausible reconstructions. 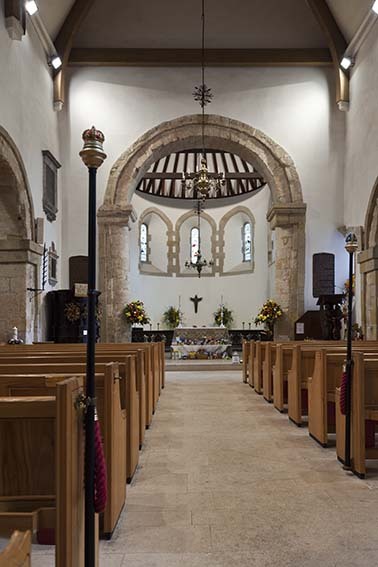 The arches from the nave into the porticus and chancel are certainly mid-C11 and for Fernie (Anglo-Saxon Architecture p153) the chancel arch is crucial in this respect. It has complex responds with heavy semi-circular half-columns that have flattened cushion capitals, abaci with curved upper sides and a head with through-stones and an outer band. The lower side arches share its relatively broad proportions, though the austerely square responds are renewed for Nibbs (1850) shows them missing entirely on the south arch. An important change was the C19 tower to the east of the north porticus, which replaced a timber belfry on the porticus itself. This arrangement was probably original, though Adelaide Tracy (1848) shows an obviously later broach (III p74). There appears to have been an arrangement of this kind at Stoughton. 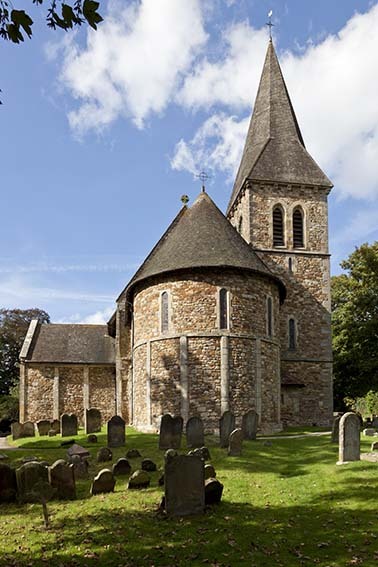 The church is a rarity as its C11 basic groundplan was never altered and later changes were confined to details. The earliest such surviving work dates from the later C13. As well as the moulded south doorway within the C11 one, there is a similar west one, with brackets each side for a vanished porch. The double south west lowside of the chancel is of the same period, though now a copy, and the end walls of both porticus were rebuilt, as the lack of a string-course shows. The rebuilt wall in the north one has only a trefoil-headed lancet, presumably as it had to bear the weight of the belfry. That to the south, though now C19, has a three-light traceried window (its form confirmed by the Sharpe drawing). At this time, if not earlier, the eastern apse of this porticus was removed and replaced by the pointed recess already noted, which was probably for a monument or altar; the lower part of this is chamfered with stops. There is a narrower one in the same position in the north porticus,but though its original form is obscured by the construction of the C19 tower, it was probably similar. The renewed three-light west window with flowing tracery of a type found elsewhere in Mid-Sussex (e g Ardingly) is C14, as is a second lowside with an ogee-head, squeezed between chancel and south porticus. A C14 or C15 two-light window shown above it in the Sharpe drawing was intended for the rood-loft, but is now gone. A big three-light south one with panelled tracery is C15. The Sharpe drawing shows windows with square and slightly elliptical heads that were then inserted in the apse and it was probably at this time that as a result of foundation problems, buttresses were built against the apse and at the north west angle of the nave. 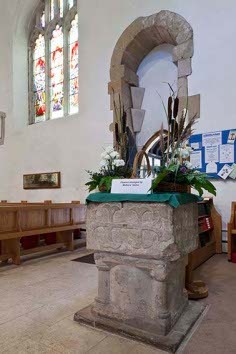 Hussey (p308) records a ‘Tudor arch’ (i e probably four-centred) tomb-recess in the chancel which has not survived. An inscription on the balustraded west gallery records the donor, Anthony Lydon, rector (d1610). 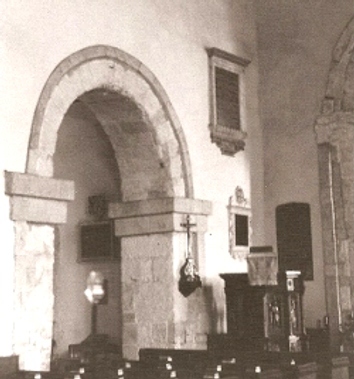 Before the mid-C19 much, including the C11 windows, had been concealed by plaster and a watercolour of c1850 by Nibbs formerly displayed in the church shows the chancel arch largely concealed by a screen, with box-pews of 1820-21 (ICBS) in the nave. Between the Sharpe drawing and Adelaide Tracy’s the buttresses of the apse were replaced by large triangular ones of brick. The presence of earlier C19 glass and of foreign fittings, known in one case to have been brought here in 1841 (see below), is evidence of work before the main restoration by A Salvin between 1869 and 1871 (B 27 p901). He completely reconstructed the chancel, though in fairness there were then fewer ways of repairing defective foundations. There were angry protests and the passivity of the Sussex Archaeological Society was particularly criticised (ibid). Salvin also repaired much internal and external stonework and replaced all the roofs, but left the nave walls largely intact. His greatest change was the tower and spire east of the north porticus, added to create space for more seats by enabling the internal bell-frame to be removed. The initial plan called for a timber-frame (Allibone p131) and the C13 style is at odds with the rest of the church. Salvin spared many older fittings (see below) and put them in or adjacent to the chancel. The timbered south porch fits in with his work, but is said to date from 1886 (KD 1899), well after his death. Salvin did install some new and more elaborate fittings, most of which were removed in the C20, when work included repairs by T F Ford and Partners (responsible architect A S Ford) in 1974 (ICBS). Much of the effect of this must have been undone by a fire in 1987, which destroyed the C19 nave roof. It was replaced the following year by Roth and Partners (i e G Claridge) (CBg 10 p47) to a new design, plastered with laminated transverse and cross beams of light wood, making the interior brighter. There were also alterations to some of the monuments. Altar rails: Foreign of c1600. They have an elaborately pierced top and have been extended to fit. This is said to have been done about a century later (BE p642), but in view of the known introduction of other foreign features in the 1840s, that is a more likely date. Candelabra: Two with twelve arms are C17 Dutch. The smaller ones are modern. Commandment boards: (Either side of the chancel arch). The depressed heads and the style of lettering both point to a date no earlier than the early C19. Font: Square bowl with carved arcading and crosses probably added c1300. The bowl has been generally assumed to be later C12, and the cylindrical base with attached angle-shafts has been identified as another font, possibly pre-Conquest (Bond p91), though there is room for doubt about this. The bowl has been recently ascribed to the second quarter of the C13 (www.crsbi.ac.uk retrieved on 22/4/2013), but assuming the arcading etc was added later, an earlier date is preferable. 1. 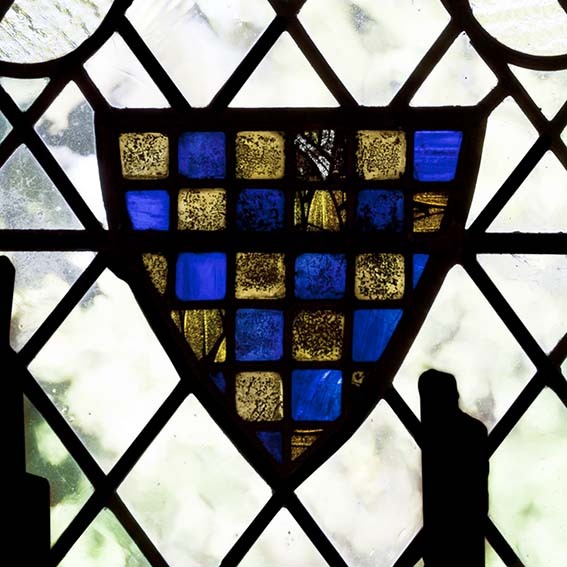 (North porticus north window) C14 shield of the de Warrennes, moved here from the head of the west window where Horsfield recorded it (I p267). 2. (South porticus south window) T Willement, 1849 (Willement ledger). Only the head remains after ‘restoration’ in 1975. 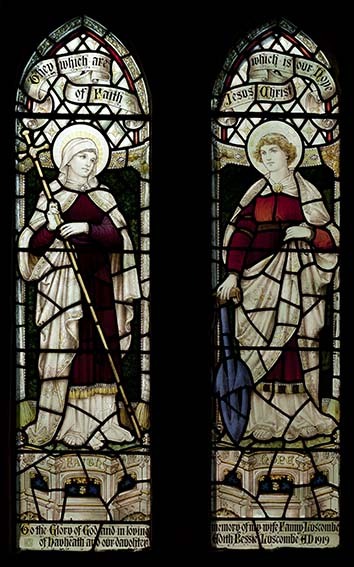 According to the same source, Willement also supplied some glass for one of the small chancel windows and one of St John the Baptist, but presumably this did not survive Salvin’s rebuilding. 3. 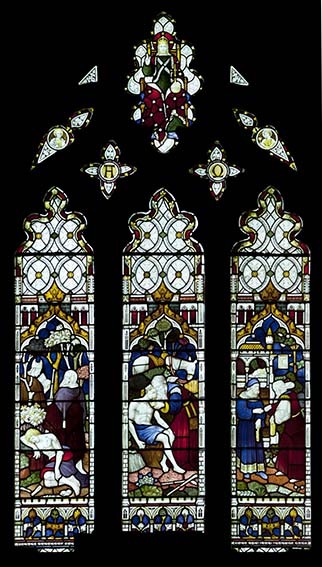 (South nave, first window) J Hardman and Co, 1857 (Order book). 4. (West window) Clayton and Bell, undated (www.stainedglassrecords.org retrieved on 29/3/2013). 5. 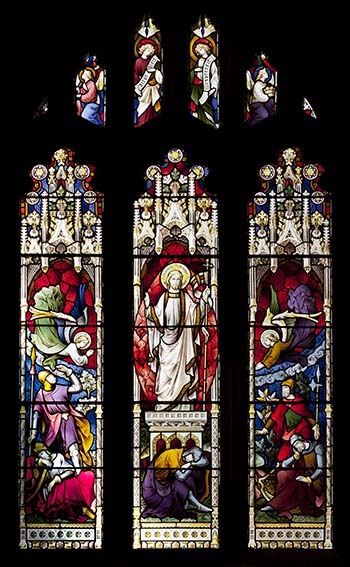 (South chancel, second window) R J Newbery, 1919 (WSRO Fac). 6. (North porticus, east window) W T Morris of Westminster, 1956 (WSRO Fac). 1. (North chancel) Leonard (d1746) and Sarah (d1750) Gale by Sir R Taylor (Roscoe p1226). It is relatively small, with a draped urn above the inscription. 2. Gilbert Joliffe (1833?) by T Smith (ibid p1154). 3. (West wall of south porticus) John Manship Ewart (d1834) by P Rouw the younger (ibid p1071). An angel kneels at a sarcophagus. 4. (Adjacent to last) Catherine Ewart (d1835) by P Rouw the younger (ibid). Though smaller, this is in the same idiom with a draped figure standing by an urn. 5. (Also in south porticus) James (d1837) and Mary (d1857) Norman by P Rouw the younger (ibid). A plain urn. 6. Margaret Joliffe (1839?) by C R Smith (ibid p1142). Painting: (Rere-arch of C14 lowside window) C14 decorative painting in red. Panelling: (South porticus) Early C17, possibly moved here at the restoration. Piscina: (Chancel) C13 trefoil-headed, reset in the C19 rebuilding. Pulpit: Handsome German renaissance work dated 1577 with figures in arches, acquired in 1841 by the rector (6 p235). An inscription from John 14, 23 in a Low German translation includes the word ‘wirth’ (= will), which may have been misread as Wörth, referring to one of two towns of that name in Germany (2 p197). Sedile: c1500, with a depressed four-centred head. Reset. Stoup: (by south doorway). Broken and without features to provide a dating, but it is probably no older than the present south doorway.